victoria thorne: At the Metropolitan Museum of Art: I like New York in June, how about you? At the Metropolitan Museum of Art: I like New York in June, how about you? The Best New York Museum Moment, 'o8. 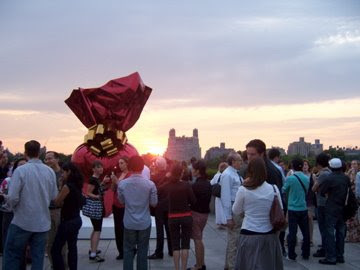 "Sacred Heart (Red/Gold)" by Jeff Koons, on the rooftop of the Metropolitan Museum of Art. There will be a gallery talk, 11:00 a.m., 19 September...certainly worth going to. This was on a Friday night, 8ish. On this wonderous rooftop, there's a Cafe during the day, and a Martini Bar on Friday and Saturday nights, 5:30-8:30. Also certainly worth going to. "saints and poets...they do, some"